It's raining, it's pouring, my herb garden has completely died from neglect, my allergies are out of control, but I can't help but love this summer slow down. Because I love the sound of rain (can you tell I'm a Vancouverite? ), the return of weather just cool enough to justify turning on the oven, and the last hurrah of fresh, seasonal berries and fruit. 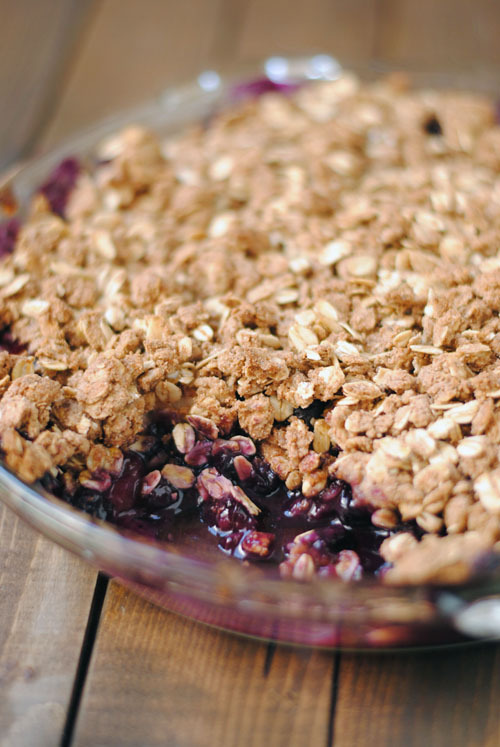 It all makes for a delicious maple blueberry apple crisp that can be eaten with ice cream for dessert, or on its own for breakfast. This crisp is a spin on one in Canadian Living, but I switched things up to suit the lack of ingredients in my cupboard, and the abundance of fruits in my fridge. I also cut down the sweet, because berries are sweet you guys, and added more topping for extra delicious. How are you enjoying the last bits of summer? Follow me on Instagram to see more end of summer treats and trips! Mix together all the filling ingredients in a large bowl, and scrape into a 9in pie dish (or equivalent). In a small bowl, combine the brown sugar, flour, oats, and cinnamon. Stir in the maple syrup and butter until everything is mixed and delicious. Sprinkle evenly over the fruit filling. Bake for 20-30 minutes, until the filling is bubbling and the top is nicely crisp and golden brown.